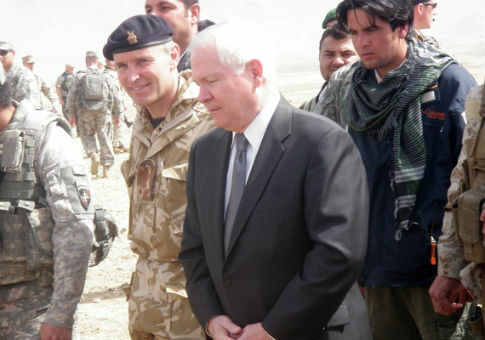 Ajmal with Robert Gates, then the secretary of defense. Ten years ago, Ajmal Faqiri wanted to help bring democracy to his home country of Afghanistan. Today, as a recent immigrant living in Maryland, Faqiri’s dreams are much more modest. He hopes that this month he will not be evicted, that his heat will work, and that he will be able to afford groceries for his family. Last year, 3,500 at-risk Afghan allies and their families sought refuge in the United States. Many of them, like Faqiri, face enormous struggles as they try to rebuild their lives with limited support from the U.S. government and federally funded aid groups. "We came with a lot of expectation … we thought we helped Americans, we will be safe," said Faqiri, a former translator for the U.S. military who once worked for Defense Secretary Robert Gates. "All these things were just a mirage, or kind of like a dream." 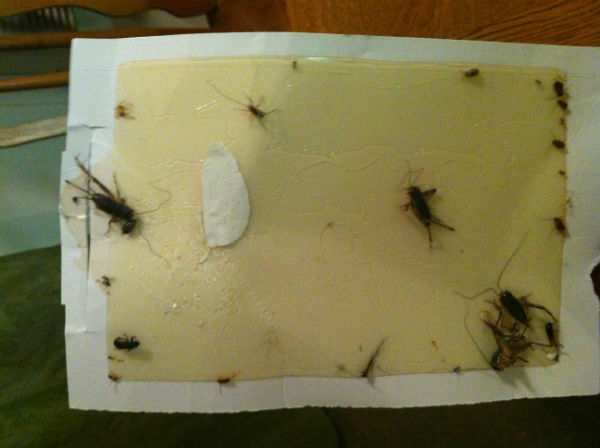 An investigation by the Washington Free Beacon found some of the U.S. military’s top Afghan allies have been placed in empty, rodent-and-bedbug-infested apartments by federal resettlement programs. Others cannot pay for baby diapers and groceries. Several families became so desperate they returned to Afghanistan, even as military interpreters remain a top assassination target for the Taliban. Faqiri arrived in the United States last January after spending three years on a waiting list for the Special Immigration Visa (SIV) program. His case was assigned to the International Rescue Committee (IRC), a group that receives federal funding to resettle refugees and SIV recipients. The IRC and similar groups are required by the U.S. government to provide immigrants with clean and furnished apartments, initial rent payments, job placement assistance, and other support. The IRC moved Faqiri into the Parkview Gardens housing complex in Riverdale, Md., where aid groups have resettled dozens of Afghan interpreters and their families. Faqiri said that there was no furniture and that the heat was broken when he arrived. His family spent the night sleeping on the floor, sharing a single blanket. David Godsted, the executive director for the IRC’s Silver Spring office, said that the problems Faqiri has faced sound like "a very unusual situation." He said that the organization furnishes homes before moving in SIVs. "We set up our apartments, we have fantastic logistics of getting things ready, and I would find that very very hard to believe," said Godsted. "If I found out [this happened], we would absolutely resolve from there instantly." Since then, Faqiri has struggled to hold a job and fears that his family is unsafe in the housing complex. Due to a string of recent break-ins at the complex, he said his wife and children say they do not want to be left alone when he goes to work in the evenings. Other Afghan allies have faced similar challenges. Last December, the Free Beacon visited a former Afghan translator named Nasralat at his apartment, where he had been living for weeks with no furniture except for a twin bed that he shared with his wife and one-year-old daughter. He said his resettlement group, the Ethiopian Community Development Council, charged him $200 for the bed. Interviews with over a dozen Afghan and Iraqi interpreters and their advocates turned up similar stories. Matt Zeller, a former U.S. army officer who runs a small advocacy group for Iraqi and Afghan SIVs called No One Left Behind, said that he often hears about experiences like this. 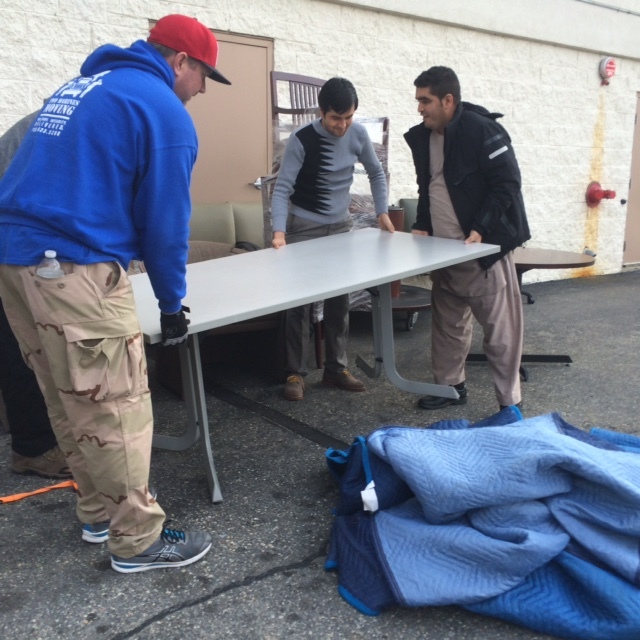 Zeller’s group has provided furniture and extended rental help for several of the interpreters interviewed for this story, including Faqiri. For Zeller, the issue is personal. He credits his own former interpreter, Janis Shinwari, with saving his life during an ambush in Afghanistan. "These are veterans. They’re veterans," said Zeller. "None of them are arriving here on the Mexican border, or over a shipping container. They’re all coming here the right way. The way we have asked people to do so." Like many translators, Faqiri spent several years in combat and estimates that he was involved in between 50 and 100 firefights against insurgents. He also served as a personal translator for Gates in 2009. 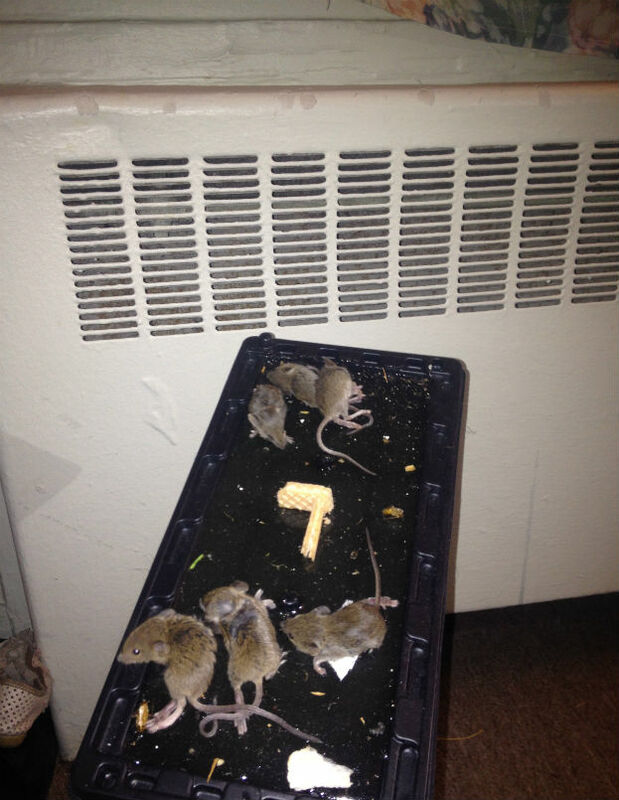 During multiple visits to the Parkview Gardens apartment complex, the Free Beacon saw evidence of rodent and roach infestations. Several interpreters said that they were kept awake by bedbugs. "When I came to my home, the first night I couldn’t sleep. They call it bedbugs. So when I sleep, I start itching," said Ahmed, a former translator who was resettled by the IRC. Others said that they were alarmed by a string of recent burglaries at the complex. According to the Prince George’s County police blotter, there were four reported break-ins at Parkview Gardens in December, including a car theft and a robbery. In September there were four break-ins reported in one five-day span, plus a theft and an assault. The IRC, which is run by former the British Labour politician David Milliband, said that it was surprised to hear the complaints about furniture, job placement, and housing from SIVs. Godsted said that his staff works hard, for long hours and little pay, and would be happy to address any concerns. "We appreciate so much, and in particular with SIVs, we appreciate what they’ve done for us, for our military and in our home countries," he said. "The last thing we want to do is to be tone deaf to anything they might need that is in our capacity to provide." Godsted said that the IRC has a partnership with Parkview Gardens, and that the apartment management always appears willing to address any issues raised by its residents. "We work with Parkview management, they’re fantastic to work with," he said. "They’re great supporters of our clients. They often employ our clients. It’s a great partnership and together we would make sure this is taken care of." The complex is owned by Arnold Berlin, who also owns several other low-income rental properties in the area. Ten years ago, housing activists picketed Berlin after residents from seven communities he owned claimed that their apartments were in disrepair and crawling with bugs and rodents. The executive manager of Parkview Gardens, David Mendick, said tenants whose apartments are burglarized should direct their concerns to the police. He added that the complex put up Wanted posters of one break-in suspect outside each of the units in December. "If you don’t want refugees to be housed in Parkview let me know," said Mendick. "If you’d rather see them homeless on the street, just let me know. Fortunately, I’ve got much more compassion than you." While resettlement groups pay the first three months of rent for SIVs, many of them are locked into year-long leases and struggle to find jobs to afford the payments of around $1,000 a month. Ahmad Shah received several eviction notices last year. He has not been able to find work since the summer, when he had a job packaging fruits and vegetables in a frozen food factory. Shah, whose right arm is partially handicapped from a bullet wound, said that he grew concerned when his hand started turning blue and going numb from cold exposure. But he said that his IRC caseworker pressed him to stick with the job. "They were making laughs, like ‘Oh it would be interesting if you had taken a picture of your hand and showed to us,’" he said. Godsted said the interaction sounded "very unlikely" considering the dedication of the IRC’s staff. Shah recently had surgery to improve his range of motion and hopes to find work after he recovers. Other interpreters said that refugee resettlement groups pressured them to keep jobs they couldn’t afford, or to sign forms that credited the aid groups for helping them find jobs they found on their own. Ajmal Sidiqi, who has a bachelor’s in English Literature from Kabul University, said that the IRC insisted that he keep a job at Pret-a-Manger, a café chain, even though he was making less than $20 a day after transportation costs and taxes. Some Afghans have found the struggle too difficult. One was a young doctor named Abid Khan* (name has been changed), who had worked as an interpreter while getting his medical degree in Kabul. But after moving to the United States he was unable to find a job and pay his rent at Parkview Gardens. He returned to Afghanistan, but regretted it. He emailed Zeller on Aug. 4, asking whether there was any way for him to get back to America. "My life is under serois threat by a Known Taliban commander named Qari Burhan who is now the commanding person of Taliban and terrorists in my village in Logar province just 30 miles south of Kabul," wrote Khan. "He is now sending threat messages threatening to kill me and my family. we are totally confused what to do [sic]." Zeller said he wrote back, but that Khan never responded. "It makes no sense from a national security standpoint," said Zeller. "If that’s the message that gets out, who’s going to support us in Yemen? Or God forbid, we’re back in Iraq?" Faqiri cannot make sense of it either. He said that he is proud of his work with Americans and described the U.S. soldiers he worked with as "heroes" who did everything they could to help Afghanistan. But he is not sure he would make the same choice again. "I believe it’s not the people [in America], it’s whatever heads the issue," he said. "I don’t know where, I don’t why, I don’t know how because I am not in the government. But it is a problem of the government." This entry was posted in Issues and tagged Afghanistan, Immigration. Bookmark the permalink.